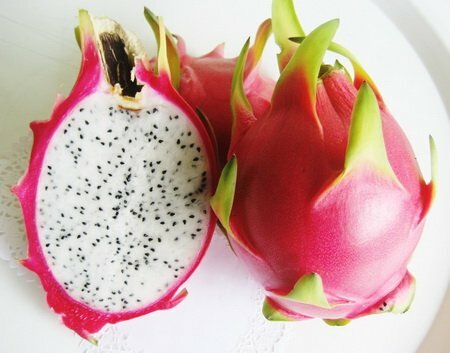 Dragon fruit, like most fruit, contains carbohydrates, the body’s preferred source of energy during a lifting session. The carbohydrates that make up dragon fruit (also known as a pitahaya) are not complex, so your body can easily break them down as fuel for your muscles. Specifically, the carb content consists of glucose and fructose, and the majority of its fiber is formed from oligosaccharides, powerful probiotics that spur the growth of good bacteria in your stomach, which can lead to better digestive health and an improved immune system. B vitamins like B1, which aids proper carb metabolism, and B3, which can improve cholesterol levels and improve circulation. The seeds, which are embedded in the flesh, are also nourishing and beneficial as they contain a healthy ratio of the essential fatty acids omega-3 and omega-6. These types of fats work together to help reduce inflammation, which is key after heavy weightlifting, and may help to reduce sore muscles and fatigue. Treat them like an avocado to find the proper level of ripeness—ideally, they’ll be firm with a little bit of give. Eating the pitahaya is simple; just cut it down the middle and quarter, if you like, or leave in two halves so you can scoop out the soft, kiwi-like flesh with a spoon. Toss it on your next salad or into a post-workout protein shake to drive nutrients into your cells after a hard training session.